Born and raised in Australia, a London resident for four decades, James (The Man from Japan, 1993, etc.) possesses all the strengths of the best British literary journalists—wide-ranging erudition, a knack for the perfectly turned sentence, a seemingly effortless wit—without the besetting weakness many of his peers display for gratuitous nastiness designed to demonstrate how much smarter they are than their subjects. James, by contrast, always lives up to his declared principle that “a limiting judgment of an artist should be offered only after full submission to whatever quality made him remarkable in the first place.” (That comment occurs in one of the valuable “Postscripts,” which allow him to admit second thoughts or clarify intent without rewriting the original article.) Seamus Heaney, D.H. Lawrence, James Agee, and George Orwell are among the writers to whom he applies exacting yet appreciative scrutiny. Even when he more or less trashes John le Carré’s pompous later novels or Norman Mailer’s embarrassing Marilyn, he voices respect for previous achievements and shows no glee over his thumbs-down judgment. James can nail a work’s essence in a phrase (the “garrulous pseudotaciturnity” of Lillian Hellman’s memoirs, for example), but the generosity and perceptiveness of his full-length appraisals are even more impressive. Poetry arouses his particular passion, as vividly demonstrated in the essays on W.H. Auden and Philip Larkin, and he’s just as good on Primo Levi and Mark Twain. Like his idol, Edmund Wilson (subject of another excellent piece), James roams with assurance through world literature past and present, acknowledging no distinctions except those of quality. He couples a democratic belief that art must illuminate common human experience with an unabashed insistence on high standards; though he has written for and about television and does not disdain mass appeal, his assumed audience here is the serious general reader. 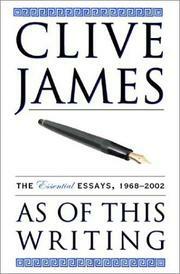 Criticism is not indispensable to art,” James writes. “It is indispensable to civilization—a more inclusive thing.” His stimulating and thrilling work forcefully makes a case for that bold declaration.